Something troubling is happening in the stock market. Not only are markets are down – the Nasdaq and the S&P 500 are down 3.1% and 2.6%, respectively, this week – but no one has come up with a convenient, compelling (and misleading) reason why. Never mind, says Matthew Klein, that US stocks are up 30% since the start of 2013. We need to know why they are down this week, as Barry Ritholz writes, because we crave meaning in a random world. Perhaps it’s all tech stocks’ fault. They have, FT Alphaville’s Dan McCrum drolly commented, “become a little bit more modestly priced”. The Nasdaq is down 7% in the last month. 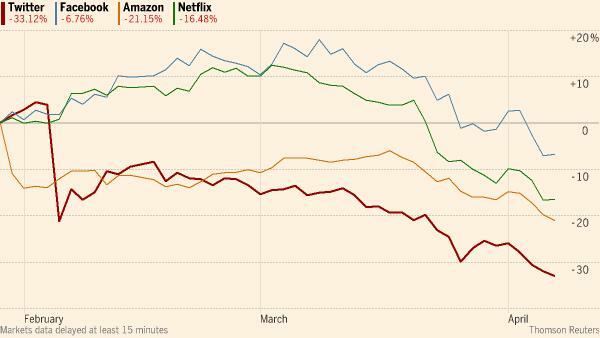 Over the past two and a half months, Twitter, Facebook, Amazon, and Netflix are down 31%, 7%, 21%, and 16%, respectively. Maybe biotech stocks are the culprit. They are down 4.5% in the last week, and 16.8% in the last month. But even analysts, people paid to draw conclusions from just about anything, aren’t sure: “Biotech Stocks’ Rout Perplexes Analysts”, the WSJ said on Thursday. The article explains the problem: biotech specialists, who know a lot about specific companies, are bullish, while generalist investors, who think 36 times earnings is worrying, are bearish. But just a day earlier, on Wednesday, tech shares were ‘leading’ stocks higher, as “biotech stocks attracted buyers in search of bargains”. Maybe, says the WSJ’s Paul Vigna, stocks are falling because they are becoming less correlated with one another. Maybe it’s earnings season: JP Morgan disappointed people. Or maybe there’s an “air pocket” in the market, which is technical-analyst speak for an ‘area on a chart beneath a line that goes up’.